Unit Liner Company opened its doors in 1967, manufacturing one product for one specific application. Since that time, we have added several divisions (Enviro-Guard, Pondliner, Livestock Shed, Pond Pro Sop) wich are individually guided and supported by outstanding management teams, each devoted to its customers and product lines. Diversity through various factors within the company, has made us stronger and better as a whole. Unit Liner Company is committed to quality, Wether serving a first time customer or a long standing client, we ensure quality service in keeping with our dependable reputation. Exceptional Customer service is a major factor in our philosophy. Unit Liner Company has grown because of our many repeat customers. We understand the level of service and commitment necessary to maintain our company to customer relationships. We want our clients to be completely satisfied with every aspect or our business. We Are Celebrating Our 50 Year Anniversary!! When you need a reserve pit lined, call us first. We work to get your pit lined to meet your time schedule. Our experienced in-house installation crews arrive at your location with all the machinery, materials and personal safety equipment to complete the project. Lining pits is our business; unlike others we don't rely on your labor to do our job. We install single-ply 20 and 30 mil polyethylene liners that resist punctures and wind damage. 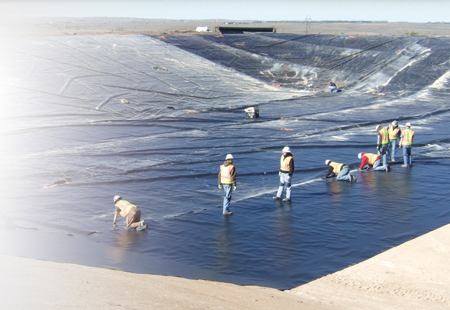 Pit liners can be installed for any pit, regardless of size and shape. All seams are wedge welded, never sewn, to provide a strong and watertight pit liner. All pit liner edges are buried in anchor trenches to firmly secure the liner into place. Designed to meet H-15, H-20, U-54 and U-80 specifications, these cattle guards are used and recommended by state and federal agencies. These guards are available in lengths of 8 feet, 10 feet, 12 feet. They can be installed end-to-end to meet your road width requirements. The H-15 and H-20 are also available in a 7.5' road length. Other options include the three rail clean out section (except on the U-80), end wings and steel post. Standard Cattle Guards are painted green. Yellow painted cattle guards are available by special order.